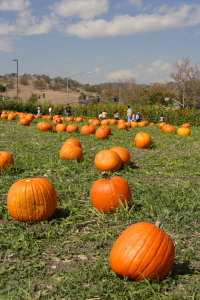 Each year for the past 3 years Bryan and I have attended the Cal Poly Pomona Pumpkin Festival. This year it was held on October 18th and 19th and as always it was a festive event. This year marked the 16th anniversary for the event which takes place across from the Cal Poly Pomona campus on the corner of South Campus Blvd and Temple Ave. The field that they use for the pumpkin patch is quite large, however, I don’t believe all the pumpkins are actually grown there as the field is usually empty all year until about two weeks before the event then the pumpkins magically appear. And there are a lot of pumpkins to be had so it must be quite a feat for the people who are trucking them in and spreading them throughout the field. The event is put on by the College of Agriculture and the Ag students volunteer in every aspect. Bryan and I got there later than usual, around 11am. We usually like to get there when they first open the event at 8am. 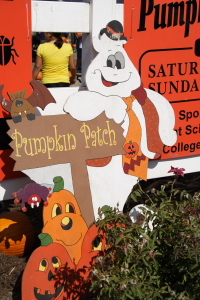 The reason for this is because this is a very popular event, literally thousands of people attend the Pumpkin Fest every year and this year was no different. When we got there it was very crowded but we made or way through towards the other side of the field. 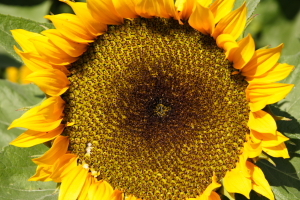 We took a few pictures of the beautiful sunflowers that they plant every year and then began the task of finding our pumpkins. For the first time this year we brought a wagon. 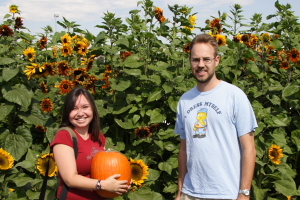 In years past we were limited in the amount of pumpkins we could get because we actually had to carry them back to the car. In case you didn’t know this, pumpkins are heavy, so we usually only got two. 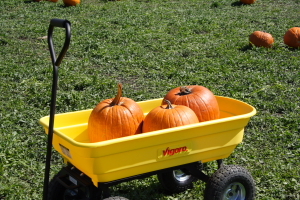 This year Bryan went to Home Depot and got a nifty little garden wagon and we took full advantage, we got five pumpkins this time around. This may seem like a lot but there are people there who get up to ten pumpkins, it’s crazy. The admission and parking for this event is always free and the pumpkins are usually $4 a piece and slightly cheaper if you get baseball sized ones. This is one of my favorite events to take pictures at because of all the beautiful autumn colors. There are a lot of other things to do at this event besides find the best pumpkin. There is a strawberry field where you can pick your own strawberries, a petting zoo for the kids, an insect fair, hay mazes, lots of food, horse rides brought to you by the Equestrian Drill Team and my favorite thing of all; the Farm Store. The farm store is also run by the College of Agriculture and many of the fresh vegetables were grown by the students themselves. The beef and pork products sold there are also raised at Cal Poly Pomona. The have a wide variety of organic foods and an outdoor nursery. I always love to go to the farm store and support the agriculture students, after all I used to be one.